We are delighted to announce that Amanda Murrell was awarded Runner Up in the Business Person of the Year award at the East of England Business Champions Awards 2016 on 25th October. Having been successful in reaching the final, she batted off stiff competition from the 7 other finalists to take runner up, coming second to Nicola Weeks of George James Bridal, who was also crowned overall Champion on the afternoon. 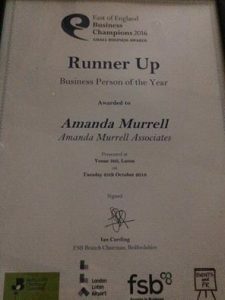 We are absolutely thrilled for Amanda and for Amanda Murrell Associates in what has been another very successful year! Next:The past 12 months we have become even more innovative for our Bedfordshire clients.